The library offers different activities which are designed to meet a variety of information and resources needs as well as serve as a basis for outreach and evangelism in both the Czech and international communities. The library serves as a culturally relevant means to reach out and engage with people who would not normally enter the doors of a church. We have organized and hosted over 30 different lecture series on a broad range of subjects including biblical studies, marriage, family and parenting, issues of life, counseling, world religions, Christianity and the arts, leadership development, and business ethics. These series have been primarily sponsored by the Institute for Christian Resources although we have also had other groups who use the library space for various events. We have also hosted various special workshops over the years including a special 5-week Children’s Literature Workshop lead by Dr. Joyce Martin a specialist in children’s literature at the University of Southern Maine. We have also had sessions on such topics as cross-cultural understanding, personal financial management and exploring reference study helps for small group leaders and pastors. Our very popular English language Story Hour (begun in February 2000) is designed for children ages 3-7 is held at the library on the second and fourth Saturday mornings of each month. The time which begins at 10:00 am, includes stories on a given theme, related crafts, songs and snack. The story hour is especially attractive for Czechs and other non-native English speakers who want their children to improve or maintain their English. We have offered several different English courses including general English for beginners and intermediate level students. Jim has also offered 6-week Theological English courses designed to help those who have good English skills in order to hopefully better access reference and theological studies resources that we have available in the library. We have also offered specialized lessons on various topics of interest with a local Czech zakladni skola (primary school) which have proved to be quite popular and successful with wonderful opportunities to share the truths of God’s Word. We have hosted a variety of after school programs including those offered by Palacek Center which is a local mother care center and has included classes for pre-school kids to learn English. We have also organized an after school program for Czech kids to learn English as well as providing support and resources for various English camps during the summer months. We have also organized and hosted Friday night film discussion times amongst university students. These proved to be quite popular despite our small meeting room. We would like to eventually have a larger space that would be more conducive to such activities. Reference Vision for more details about future possibilities. 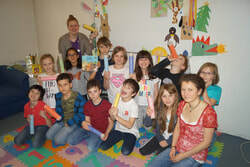 For more photos of various activities click on Photos or visit Prague Christian Library on Facebook.